Did you notice the following phrases in the letter that I shared last Sunday? This is useful vocabulary even if you're not doing the General IELTS test. Note: in the phrases above, gig, blown away, catch and make it are informal. Do you know the meaning of these words / phrases? The following sentences were written by students below this lesson, and describe an enjoyable day in the countryside. But can you find and correct the mistake(s) in each one? If I have chance to go there, I love to visit there again soon. I took too many beautiful pictures on my camera. It's about 80 km far from the city. I am going to talk about one day that I have spent in the countryside on May. It was a countryside near to my city, where some relatives were living there. Here's my answer for the 'silkworm' diagram task that you can see here. The diagrams illustrate the stages in the life of a silkworm and the process of producing silk cloth. There are four main stages in the life cycle of the silkworm, from eggs to adult moth. The process of silk cloth production involves six steps, from silkworm cocoon to silk material. At the first stage in the life cycle of a silkworm, the moth lays its eggs. Around ten days later, silkworm larvae hatch from the eggs; these larvae feed on mulberry leaves. Then, after four to six weeks, the larvae become covered in silk thread, and it takes between three and eight days for a full cocoon to be produced. For silk cloth production, a cocoon is first selected and then boiled in water. After boiling, the silk thread that makes up the cocoon is unwound, and then several strands of thread are twisted together. At the fifth and sixth stages in the process, the thread can either be dyed and then woven into silk fabric, or it can be woven first and then dyed subsequently. Here's another band 9 sample answer. In many cities the use of video cameras in public places is being increased in order to reduce crime, but some people believe that these measures restrict our individual freedom. It is true that video surveillance has become commonplace in many cities in recent years. While I understand that critics may see this as an invasion of privacy, I believe that the benefits do outweigh the drawbacks. There are two main reasons why people might disapprove of the use of video cameras in public places. The first objection is that these cameras invade our privacy, in the sense that we are constantly being watched by the authorities or by private security firms. Many people find this intrusive and feel that the recording of their movements is a form of state control that curtails their individual freedom. The second argument against the proliferation of CCTV cameras is that they are being used as an alternative to police officers patrolling the streets. If this is indeed happening, then it is unlikely that members of the public will feel safer. In spite of the drawbacks mentioned above, I believe that the use of video cameras to monitor public areas is a positive measure. The key objective of video surveillance is to deter criminals and to prevent crime. For example, petty criminals like shoplifters and pickpockets are less likely to operate in parts of cities where they know that they are being watched. At the same time, when crimes are committed, the police can use video evidence to catch and prosecute offenders. Therefore, in my view, video cameras offer valuable support to police officers, and they make cities safer for inhabitants, workers and visitors alike. In conclusion, it seems to me that we gain more than we lose from the enhanced security that CCTV cameras bring to our cities. A good way to improve your listening skill is to transcribe short recordings. For example, I'm sure you could manage to transcribe one minute of English every day. Take any recording of English speakers that you find on the Internet, or use an IELTS test. I recommend using news programmes, documentaries, or any part of an IELTS test (section 4 might be the best for this exercise). Listen to the first minute of the recording only. Listen to it once without writing anything. Listen to the first minute again, and try to transcribe (write down) everything that you hear. Listen as many times as you need to, until you have the full transcription on paper. Check your transcription by turning on the subtitles option on the video (most video websites now have this), or by checking at the back of the book, if you're using an IELTS test. Read the following extract from an article in National Geographic magazine (September 2017 edition, page 26). The Brazilian pepper tree, an invasive plant in the southern United States, is showing great potential in the fight against antibiotic-resistant bacterial infections. A team of scientists studied historical accounts of its use in traditional South American medicine from as early as 1648. Focusing their experiments on its fruits, which reportedly were used to treat wounds, they then produced an extract that’s able to disarm a virulent type of Staphylococcus bacterium. Modern antibiotics are designed to kill bacteria. But some bacterial cells survive and pass on their resistance to their offspring, making it increasingly difficult for physicians to fight tenacious infections that threaten their patients’ lives. The Brazilian pepper tree extract deploys an unconventional tactic against infections. It prevents bacterial cells from communicating, which keeps them from ganging up to create tissue-destroying toxins. That, in turn, gives the body’s immune system a change to mount it’s own defence against the bacteria. One of the four titles below is the real title of the article. Which do you think it is? Try to explain why. I promised to make an online version of my IELTS teacher training courses a long time ago. I've had too many problems trying to create an app, so I've decided on a new approach. My new service is called "How to Teach IELTS" and you can read about it here. It starts next Sunday 1st October. Here's my band 9 answer for the question that I showed you last Saturday. Can you find any good vocabulary in my answer? It's always a good idea to do the most recent tests that have been published in the official Cambridge IELTS books, so get a copy of book 12 if you can. I'm going to start working on the tests in book 12 with my students, so you can expect to see some lessons about it here on the blog soon. Before we try the 'countryside' task that I shared in last week's lesson, let's see if we can find some good ideas to help us. There are plenty of tourism websites with descriptions of places to visit in the countryside, so we should be able to "steal" some nice phrases. I'll try to use some of these phrases in my full answer. 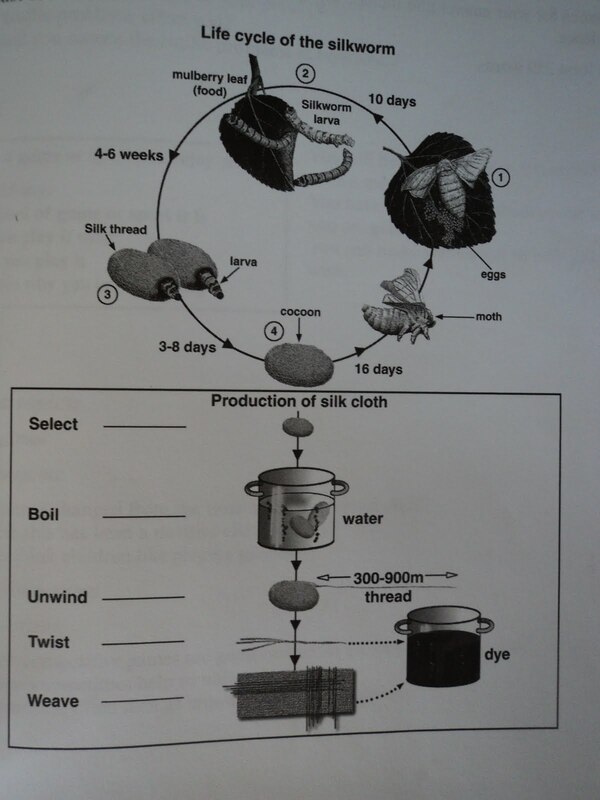 There's a nice task about the life cycle of a silkworm in Cambridge IELTS book 6 (click here to see it). I wrote an introduction and overview for this task back in 2010 (here), but for some reason I didn't share my finished answer. I'll publish it next Thursday, but maybe you could try writing your own paragraphs before then. If you've read enough of my blog lessons, you'll know that I often include three ideas in my main body paragraphs (e.g. firstly, secondly, finally). But what if you only have two ideas? Let's have a look at a "two-idea" paragraph today. If you're living in the UK, there's still time to book a place on one of my one-day IELTS courses this coming weekend. On Saturday 23rd I'm running a course in Manchester, and then on Sunday 24th I'm teaching in London. For more information click here. Listen to the following recording about the problem of melting Arctic ice. Fill each gap in the summary below with ONE WORD AND/OR A NUMBER. Scientists in Alaska are sounding the ______ about rapidly melting polar ice. The Arctic sea ice is ______ at a rate never seen before, and this is expected to have an impact over the next ______. The Arctic is warming ______ as fast as other parts of the planet. An organisation called NOAA is ______ the Arctic sea ice, and believes that it has thinned from ______ to only ______ in some areas. Let's look at some examples of paraphrasing, using the text below. What is an 'elevator pitch'? An “elevator pitch” is an overview of a product, service, person, group, organisation or project, and is often part of a fund-raising, marketing, brand or public relations program. The name "elevator pitch" reflects the idea that it should be possible to deliver a short but effective presentation in the time span of an elevator ride from the ground floor to the directors’ boardroom on the top floor of a building. An elevator pitch is often used by an entrepreneur pitching an idea to an investor to receive funding. Venture capitalists often ask entrepreneurs to give an elevator pitch in order to quickly weed out bad ideas and weak teams. Other uses include job interviewing, dating and professional services. Proposals for books, screenplays, blogs and other forms of publishing are often delivered via an elevator pitch, which may be presented in oral, written or video formats. Which words or phrases in the passage are similar to those below? IELTS Advice: how good at paraphrasing are you? A fast way to test someone's ability to speak a language is to ask them to paraphrase something - to express the same idea in a variety of ways. Some students find this difficult, and they usually need more help with vocabulary and ideas. By contrast, the students who do this well tend to reach their IELTS goal much more quickly. If you're looking for the secret to a high IELTS score, paraphrasing might be it! We haven't looked at a General Writing Task 1 question for a while, so here's one for us to work on. If you're doing the General test, give it a try. Describe an enjoyable day out in the countryside that you had. Feel free to share your ideas in the comments area below this lesson. I'll continue with this topic next Friday. When describing a graph or chart, you almost never need to use the passive. However, you probably will use the passive when describing a process diagram. Imagine we have a diagram that shows the process of recycling used glass. One step in the process is labelled "grinding machine" (to grind means to crush or reduce into small particles). Do you know the past participle of the verb grind? If you don't, you won't be able to make a passive sentence. But don't worry; there are various ways to describe this step. I would probably use the last sentence above in my report, but the others are all acceptable. A student asked me to go back to the question below. I started to look at this topic back in October 2014 (here), but I didn't share a full essay about it. It is true that video surveillance has become commonplace in many cities in recent years. While I understand that critics may see this as an invasion of privacy, I believe that there are more benefits than drawbacks. - Quickly analyse the introduction above. What does it contain? - Suggest some benefits and drawbacks for the main body paragraphs. Write one word and / or a number for each answer. 1) The first instruction is easy: make sure you only write one word. If you write two words (e.g. "a pen"), your answer will be wrong. 2) The second instruction means that your answer can be any of the following: one word, one number, a word and a number (e.g. 12th September). 3) The third instruction means that your answer can be any of the following: one word, one number, a word and number, two words, two words and a number (e.g. 15 Bank Road). If you see this instruction, it is likely that one of the answers in that section will require two words or two words and a number. 4) The fourth instruction means that your answer can be any of the following: one word, two words, three words. If you see this instruction, it is likely that one of the answers in that section will require three words. - Hyphenated words (e.g. hard-working) are counted as one word. - You won't be tested on contracted words (e.g. doesn't). Yesterday I wrote about paraphrasing in the context of writing task 1. But paraphrasing is even more important in the reading test. In every IELTS reading test, the majority of questions paraphrase something from the passage. If you can find and understand the part of the test that has been paraphrased for each question, you'll probably get the right answers. When I write about the "keyword technique" in my lessons, I'm really talking about paraphrasing. Did you notice the following examples of paraphrasing in the task 1 answer that I shared on Thursday? IELTS Advice: warning about templates! From the comments that people wrote below Wednesday's lesson, it seems that many students find essay templates useful. However, I think it's important to repeat the warning that I gave in my own comment below that lesson. Templates can certainly be useful, as they can help us to quickly organise our ideas. Also, it is inevitable that we will need to use some 'linking' words and phrases in our essays. However, there is also a danger that people focus more on the template than on answering the question with good ideas. Templates and linking are not the secret to a high score in the writing test. They just do a simple job - they help you to organise your ideas, that's all. In the end, your score will depend on the quality of language that you use to express ideas, not simply to organise them. So, learn some basic template / linking / organising language, but don't become obsessed with it. Spend most of your time working on topic vocabulary and your ability to express and develop "real" ideas. If you've prepared ideas for the six main topic areas in part 2, are you also ready to adapt those ideas if the topic is slightly different? For example, if you've prepared a description of a family member, would you be able to use some of the same ideas to describe a famous person? Or if you've prepared a description of a film, would you be able to use some of the same ideas to describe a book or an advertisement? My tip: when preparing the topics, think about 'theme language' and then think about how you could adapt your ideas for similar tasks. I've now written my full sample answer for the task below. Let's compare the 'template' language that I used to organise the ideas in my two most recent essays. In last week's permissive parenting essay, I didn't use much template language at all. Here are the linking / organising phrases from that essay. I don't think we can really call this a 'template'. Now look at the homework essay that I wrote back in June. In that essay I used a more typical 'template' structure. In conclusion, ….. certainly has its drawbacks, but I believe that the benefits outweigh them in the long term. What do you think we can learn by highlighting the 'template' language from my essays in this way? Listen to the following excerpt from a lecture about anthropologists and archaeologists, and fill the gaps in the summary below. Both anthropologists and archaeologists study the way people live together. Anthropologists study humans’ physical, social and ______ development, and they ______ research by going to locations to ask questions and make ______. Archaeologists study past societies through their material ______. They recover and examine evidence such as ruins, ______ and pottery in order to understand the history, customs and living ______ of earlier ______. These scientists also examine aspects of living societies such as ______ differences, physical ______, music or religion. Their field is the wide ______ of human social experience. Read the following summary of a book called Deep Work. “Deep work” is the ability to focus without distraction on a cognitively demanding task. It's a skill that allows you to quickly master complicated information and produce better results in less time. Deep work will make you better at what you do and provide the sense of true fulfilment that comes from craftsmanship. In short, deep work is like a super power in our increasingly competitive twenty-first century economy. And yet, most people have lost the ability to go deep, spending their days instead in a frantic blur of e-mail and social media, not even realising there's a better way. In Deep Work, author and professor Cal Newport flips the narrative on impact in a connected age. Instead of arguing distraction is bad, he instead celebrates the power of its opposite. Dividing this book into two parts, he first makes the case that in almost any profession, cultivating a deep work ethic will produce massive benefits. He then presents a rigorous training regimen, presented as a series of four "rules," for transforming your mind and habits to support this skill. A mix of cultural criticism and actionable advice, Deep Work is an indispensable guide to anyone seeking focused success in a distracted world. Choose the best answer to each of the questions below. 1. What is “deep work”? 2. What does the author of Deep Work aim to do in the first part of the book? Did you notice the following sentence in Wednesday's essay? This is a nice way to introduce a personal example in the writing or speaking test. Having worked with children myself, I have learnt that clear expectations and boundaries are necessary. Having lived abroad myself, I understand how important it is to learn about local customs. Having never tracked my fitness goals before, I found the new app really useful. Notice that this is all "topic vocabulary", which contributes to the 'task response' and 'lexical resource' scores. The words and phrases above are the key reason why my essay would easily achieve a band 9.